SACRAMENTO, Calif. (CN) – While the triumphant return to California of pineapple express storms over the last week put a dent in the state’s historic drought, water experts reiterated Thursday that the drought is far from over. 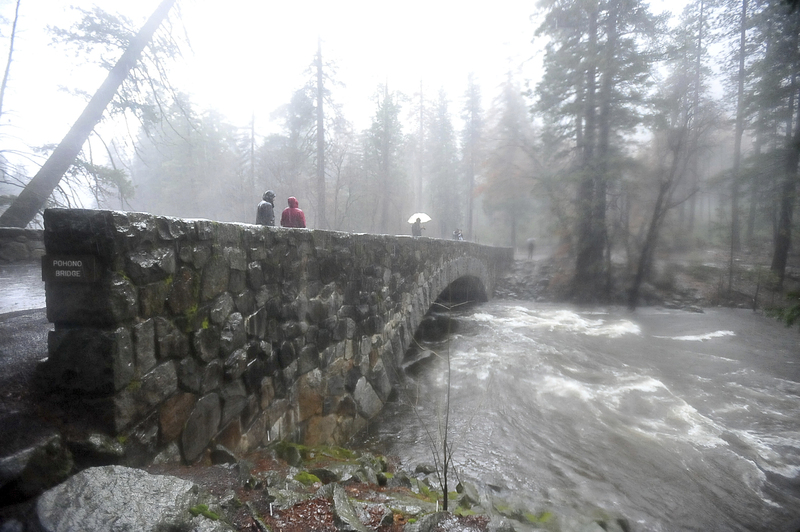 A January deluge fueled by atmospheric rivers from the Pacific Ocean has inundated Northern California, quickly bringing the state’s snowpack back above normal and rainfall amounts well above average for this time of year. The impressive storms brought relief to much of the parched Golden State, with federal officials saying Thursday that more than 40 percent of the state is no longer experiencing drought. But while the spate of wet weather and Thursday’s drought monitor report appeared to signal good news, indicating that California is slowly creeping out of drought, the weekly federal drought update combined with news footage of dams overflowing and rivers flooding is likely giving residents the wrong impression, according to Ted Thomas of the California Department of Water Resources. Thomas said the drought monitor’s report doesn’t give the “full picture” of California’s water situation because it takes a short-term view of the drought and focuses on recent precipitation. “It’s not designed to reflect a state like California that has an extensive system of water storage and water delivery infrastructure,” Thomas said. “It doesn’t reflect the fact that California depends heavily on groundwater,” he added. With a lack of water being delivered by state and federal water projects during the drought, California’s lucrative agricultural industry has been forced to rely on groundwater to water their thirsty crops – drilling expensive wells to tap into underground aquifers at an unmatched pace. Extreme groundwater pumping has decimated the Central Valley’s aquifers, causing scientists to predict that the ancient underground water savings banks may never be replenished. In 2015, NASA scientists warned that the Central Valley aquifer sitting below the state’s most productive farmland has been drained to record-low levels and caused parts of the valley floor to sink and collapse. Even with Northern California precipitation levels on pace to top 1982-1983 as the wettest year on record, there are still small communities without reliable running water. The state has been delivering bottled water and temporary water tanks to East Porterville in Tulare County since 2014. Extreme drought remains in Los Angeles, San Diego and Santa Barbara counties, along with major parts of the Central Valley farming region. Many Southern Californian cities haven’t received an average winter’s rainfall in six years. According to the federal drought update, an estimated 26 million residents – over half the population of California – are living in areas still impacted by drought, with 58 percent of the state experiencing some level of drought. Drought was also on the minds of state lawmakers Thursday, as a bipartisan group of Assembly members toured the site of a proposed $4.4 billion new reservoir. Sites Reservoir in rural Glenn County would draw water through a pipeline from the Sacramento River and provide an estimated 500,000 acre-feet of water – enough to serve 1.2 million families annually. Backers are hoping to fund the water storage project with billions in voter-approved bonds and contributions from California water suppliers. Assemblyman James Gallagher, R-Yuba City, hosted the tour and said the project would provide much-needed water storage, flood control and new jobs. “The Sacramento River is running high and fast. Sites project would pump water from this river into the reservoir,” Gallagher tweeted. Mount, who also co-founded the Center for Watershed Sciences at UC Davis, said “maintaining momentum” on finding solutions to the state’s water woes is critical despite the record-breaking rainfall and snow. “But the rains did not wash away California’s major water challenges. There are big decisions ahead – many to be made this year – about how to sustainably manage groundwater, improve storage, resolve the problems of the [Sacramento-San Joaquin River Delta] and arrest the decline of our native fish and wildlife,” Mount said.